Filed under art on April 18, 2015. My go to daily pen is the Pilot Precise V5 RT. 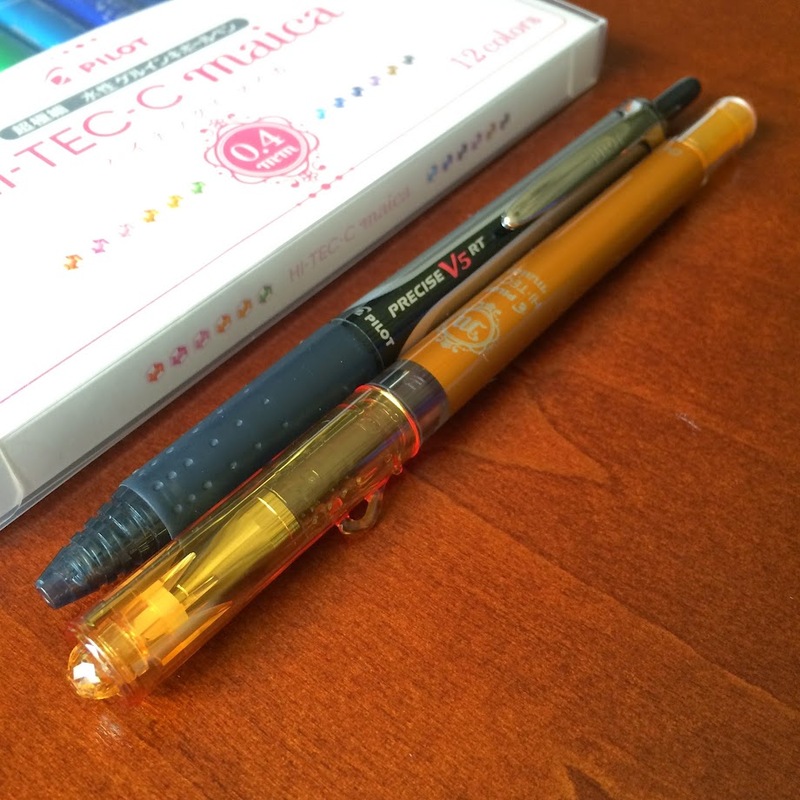 This inexpensive pen is the perfect daily use pen for the type of writing I do. Luckily, these pens are on our college’s purchase list and I am able to order these by the box and keep them in my desk, jacket, car and traveler’s bag. I like the pen so much, I decided to see what else Pilot has to offer. 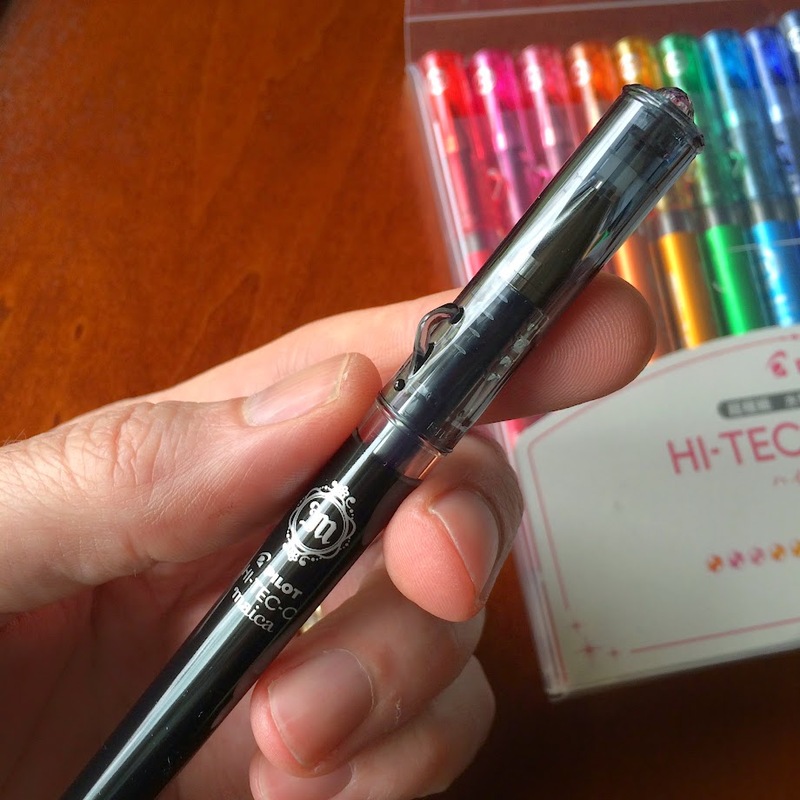 Specifically, I was looking for something with color as an alternative to the Staedtler Triplus Fineliners I reviewed previously. Don’t get me wrong, I don’t intend to replace the Staedlters. They are a good go to color marker. 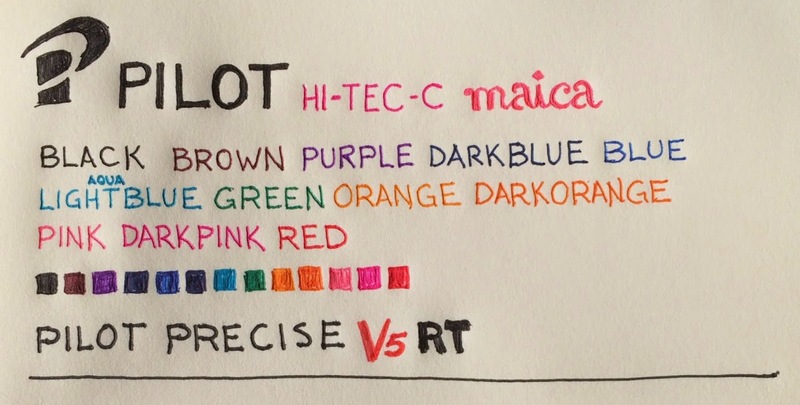 My goal is to simply experience color in a pen that is similar to the Pilot Precise V5 RT. 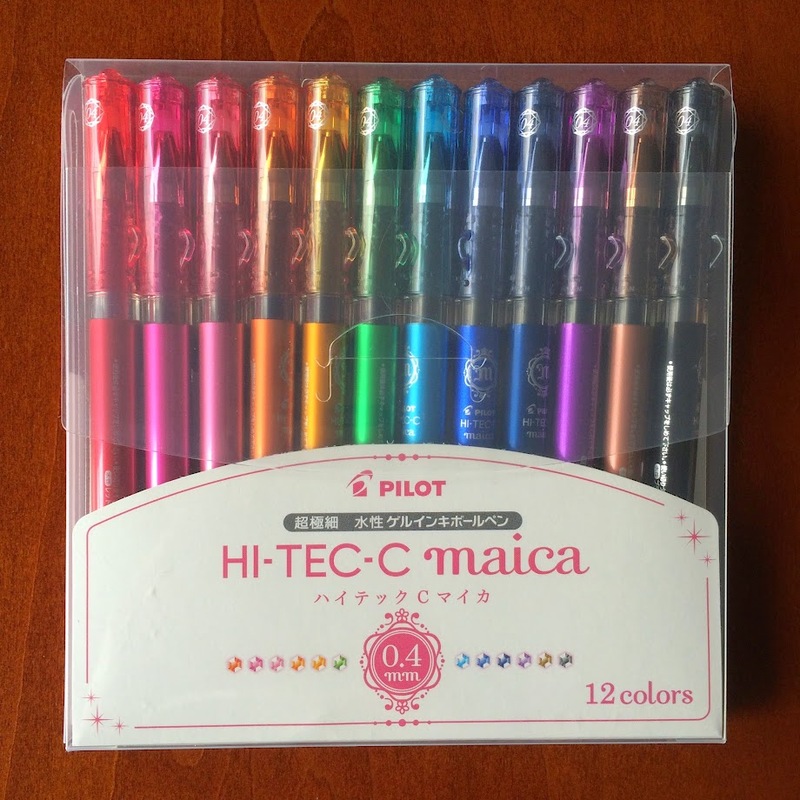 After much research in the Pen Addict Slack room and at Amazon, I decided to try the Pilot HI-TEC-C maica .04 twelve color set. For $18.00 (or $1.50 a pen), this seemed like a good deal that would fit within my pen budget. Amazon customers gave the set a 4.5 star review. Good enough for me. Add to Cart. Purchase. A couple of days later, the pens arrived in an over-sized Amazon box. I removed the pen set from the large box and found a set of pens that were absolutely stunning, and they were still in the box! Even better, no heat shrink wrapping to contend with. I quickly noticed that the package labels were in Japanese. I flipped the box of pens over and found even more Japanese labels, as shown in the image below. I do not speak, nor read, Japanese, so I am not going to learn anything about this set from the labeling on the back. If anyone out there can translate the packaging, I would be appreciative. The inclusion of a case for any multi-color pen set is an extra perk and Pilot doesn’t disappoint. It’s a basic case, no stand, but it does what it needs to and is easy to open and close using a simple flap in slot design. Time will tell if it can hold up to the type of abuse I’ll put it through, but my quick guess is that the pens will run out of ink before the case deteriorates. My only concern with the case is that the top wants to return to close making it difficult to quick remove and replace pens. As wear and tear takes its toll, I expect the cover will begin to lay flat. 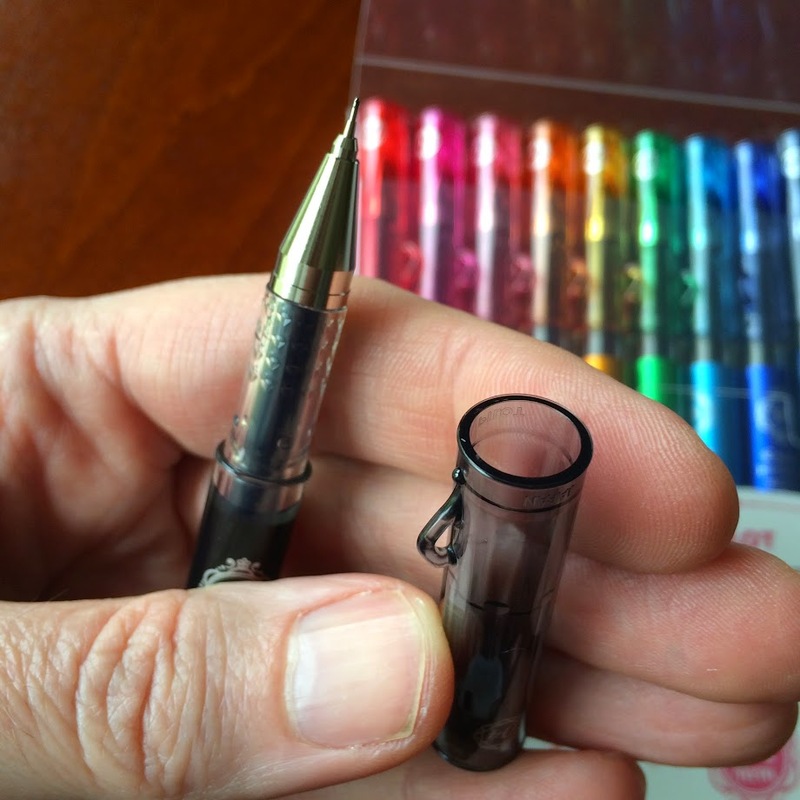 Opening the case highlights the pen colors. It is an odd choice of twelve colors, as you can see in the image below. Looking at the packaging, color options, and the pen design, I am left to wonder if these pens are not meant to appeal to young females. Even so, who cares. These pens look great, as shown in the image below. While the shells are all plastic, I like the simple and slim industrial design that hints at detail. The semi-transparent plastic case for each pen is well made and the cover snaps on in a very reassuring way. 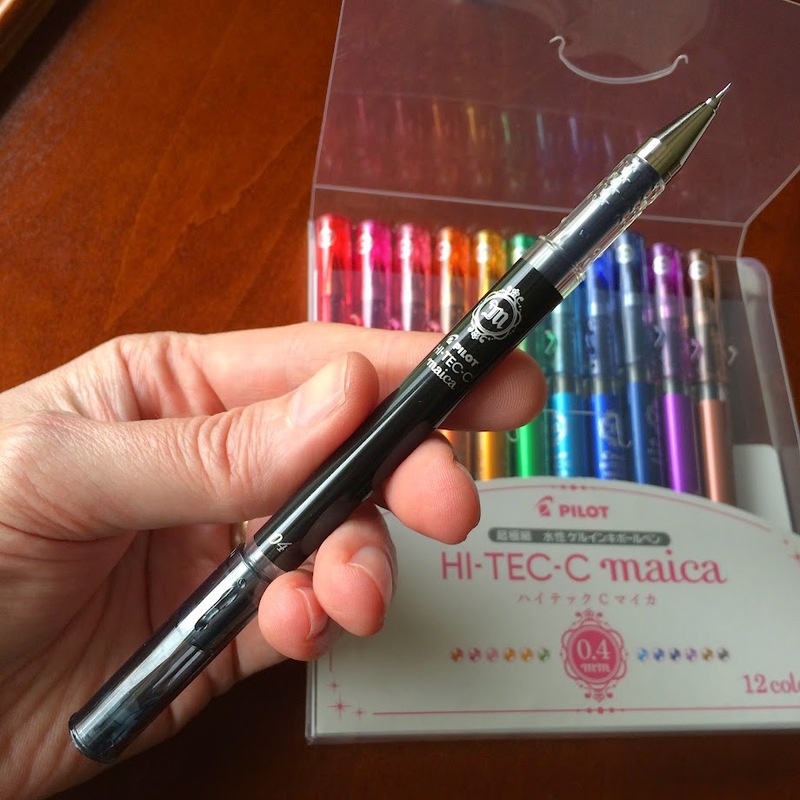 Labels on the pens are crisp and the maica logo is regal and adds design interest. On the pen cover is, what I would learn through online research, a charm holder. Yep, these are for the younger female set. Did I mention I don’t care? Removing the cover, as shown in the image below, reveals a steel pen tip that holds a 0.4mm ball point fine liner. That’s one tiny ball point. The pen tip is solid, but how will it write? That test will come later. For now, let’s put the cover on the end of the pen and check out the appearance of an open pen. Long, lean and ready for writing. These colorful pens impress in their ready to write configuration. Below is a comparison of three pens in both open and closed configurations. You now know that I really like the look of these pens, and looks are important when it comes to my pens and pencils, but how do they write? Can they keep up with my trusty Pilot Precision V5 RT? I ran the complete set through a quick test. I’m a sketchnote creator and my educational background is drafting; old school drafting; before computer-aided design. I learned to draft on a board and had to learn how to letter. I’ve not drafted for some time, so my lettering does get a bit sloppy at times. I decided to run the maica’s through a quick lettering test. Below is the result. thin lines - I like thin lines! The Pilot Precise V5 RT did not fair as well, and this was my old trusty! As you can see in the image above, the lines are blotchy and there is significant pooling at the start and end points. When I filled in an area, it bled through the paper. I used a LEGO Moleskine that captures my blog ideas. The pages are not thick, but I did not expect the Precise to bleed through. 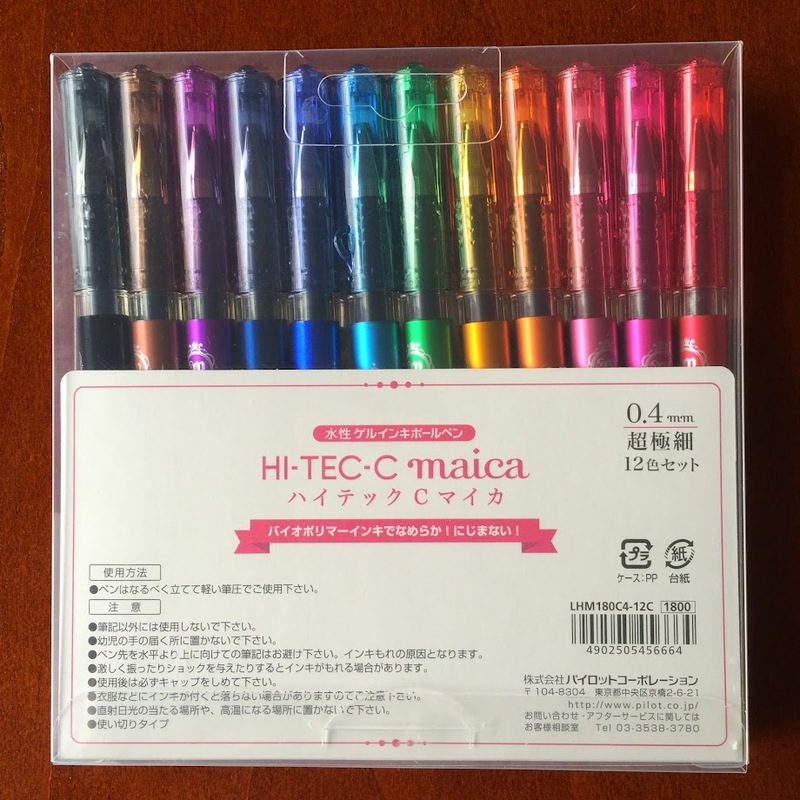 I like the Pilot HI-TEC-C maicas so much, I may have to purchase a few black individual maica pens and try them as my daily go to pen. The only thing I miss from the Pilot Precise V5 RT is the rubberized grip and I’m not sure I can give that up for day-to-day usage. Overall, I am pleased with these pens. Save for the odd color variety choice, these pens write well and look good doing it. I plan to run them through their paces a bit more during a few up coming meetings. If my review changes, I’ll be sure to drop some comments below and share my updates. 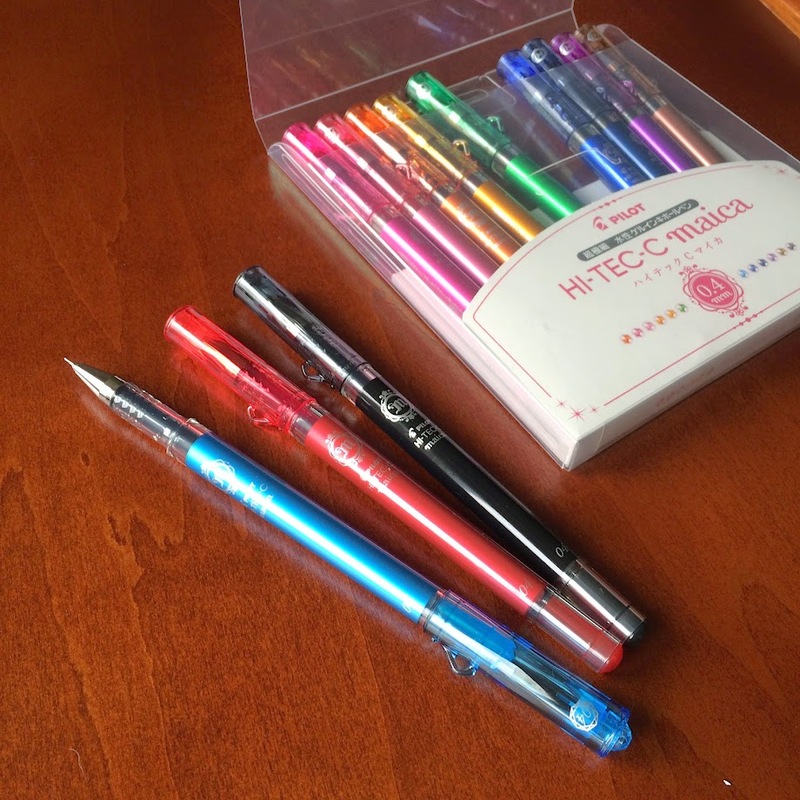 Although this set appears to be geared toward the younger female set, I would recommend these pens for daily use by anyone who wants to add a thin stroke splash of color to their writing. Be prepared though, as you use them, they are sure to draw attention. However, if you prefer bold strokes and a variety of colors, avoid this set and consider the Staedtlers I reviewed earlier. 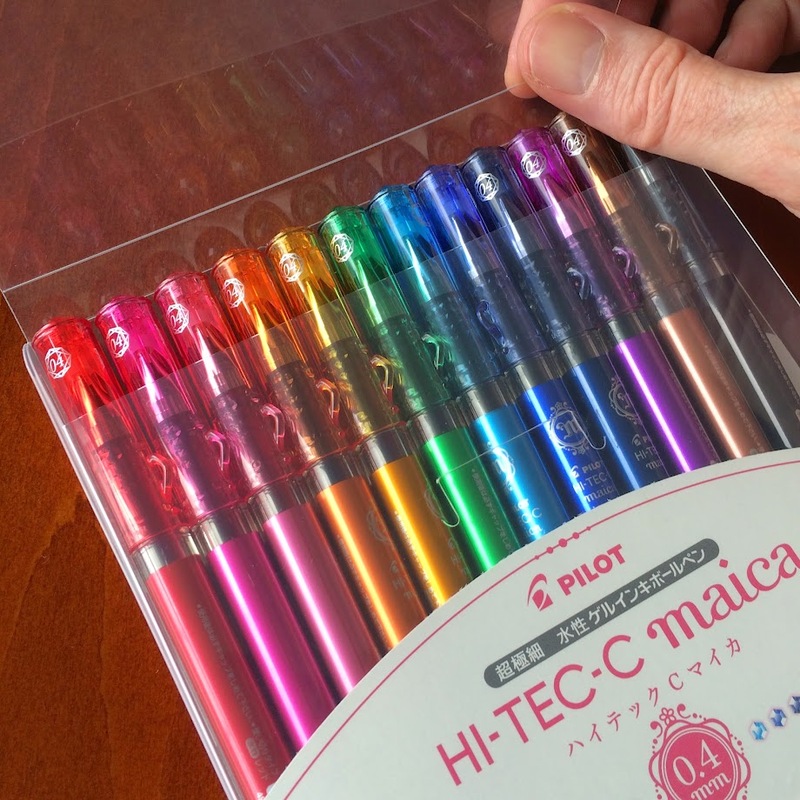 Another recommendation is to gift this Pilot HI-TEC-C maica set. Pen addicts will love them and at $18, they are an exceptional value that are sure to be appreciated by any pen aficionado - or young female. 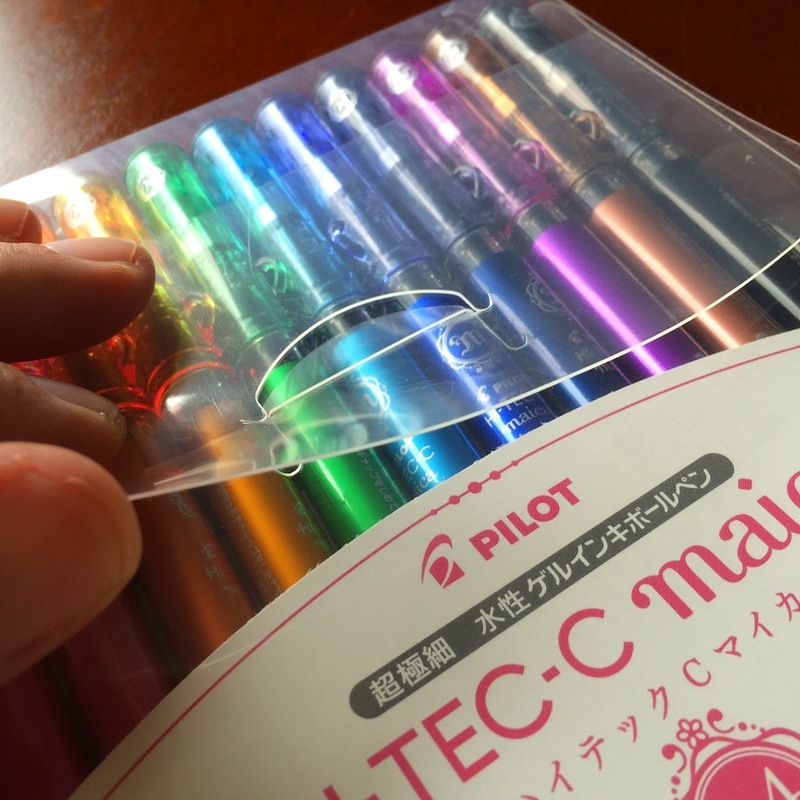 A bit more research reveals that Pilot sells another variation of these pens, the 0.4mm Pilot HI-TEC-C Gel Ink Pen ten color pack. These are more pricey at $40, so it might be awhile before my pen budget recovers and I can review this set. Even though there are fewer colors, the color selection seems more in line with my preferences. Those with fat wallets, may want to give these a try.